The Fox TV show "The Resident" takes on type 1 diabetes and gets it right! This week's episode "The Prince and the Pauper" features two plot lines about diabetes. Stacey speaks with the co-executive producer Andrew Chapman on why this issue and why now. Chapman lives with LADA (Latent Autoimmune Diabetes in Adults) also known as type 1.5. He tells Stacey there are two other people with diabetes on the writing staff. See Chapman's play 99 Tropes in Seattle later this year! Also this week, what researchers are learning about OpenAPS – the do it yourself closed loop – from Twitter conversations! Read the study write up here. Use this link to get one free download and one free month of Audible, available to Diabetes Connections listeners! You can get Bright Spots and Landmines by using this link. 43:30 Stacey talks about Chia Pudding - it needs a new name!! Author KJ Howe is back with another book in the Thea Paris thriller series. Skyjack, the sequel to The Freedom Broker, is an action-adventure series where the main character, a hostage rescuer and seriously tough lady, also happens to live with type 1 diabetes. We find out why Howe decided to focus on diabetes for this series; she has a background in medical writing but doesn't have type 1 herself. She also shares tips for aspiring writers and talks about her annual Thriller Fest in New York - this year, George RR Martin is making an appearance. Our community connection this week is Christine Fallabel. She got our attention with a column she wrote about not wanting to be anyone’s diabetes hero as well as talking about her marriage to someone without type 1. Christine is also the American Diabetes Association’s Director of State Government Affairs and Advocacy for the Mountain Region, covering 9 states. 2:30 Stacey welcome and talks about travel with Benny. He seems to think it's okay to throw all his diabetes gear on the luggage conveyor belt. Austin Basis, best known for his role on TV's Beauty and the Beast, navigates a Hollywood career while living with type 1. Now he wants to reach kids with a new comic book about high school kids with disabilities who are secretly superheroes. Austin tells us about The Kinetix and how he and a few friends came up with the idea. Now they have a Kickstarter campaign to make it happen. We also talk about growing up type 1 with a dad who owns a candy store, what made Austin want to pursue acting and how he manages diabetes on set and during auditions. Austin interviewed actress Brec Bassinger for the 2017 People to Know issue of Diabetes Forecast Magazine. Brec was just on Fear Factor and we spoke to her last year as she attended JDRF's Children Congress. In our Know Better segment, diabetes camps for grownups! Find out what Beyond Type 1 and Connected in Motion are offering up, as well as a Survive & Thrive summer program in New Jersey at Camp Nejeda. And Stacey shares a bit about upcoming travels, including disclosures about JDRF Summits and the Lilly Blogger event coming up this week. Jennifer Stone, best known as Harper on the Disney Channel's Wizards of Waverly Place, was diagnosed with diabetes four years ago. At the time, she was told to give up her dream of acting. Instead, she found a great care team, got educated and leaned on support of family and friends. She has two movies coming out in 2018. Jennifer has LADA, which is sometimes called type 1.5 and we talk about what that means and why it's often misdiagnosed. In our Community Connection this week, you'll hear from Trudy Peters with some advice about living well with diabetes for 58 years. And in Now you Know, how a spider web inspired a new way of looking at implanting islet cells. CNN Correspondent & author Oren Liebermann has quite an unusual diagnosis story. He found out he had type 1 while on an around-the-world adventure with his wife. Oren shares how he found he had type 1 in Nepal, how long it took back to get back to the US and why he decided to write "The Insulin Express." The College Diabetes Network is out with something new. Find out about You've Got This: A Guide for Newly Diagnosed Young Adults with Type 1 Diabetes." Stacey speaks to Deja Gibson and Andy Zieger about why something like this is needed. After weeks of travel and months of work, the Bike Beyond Documentary is unveiled! Plus, Beyond Type 1 celebrates Dr. Frederick Banting's birthday. Sign a card and help others in need. Join the New Diabetes Connections Facebook Group! 4:15 Bike Beyond the Documentary & Beyond Type 1 celebrates Dr. Banting's Birthday. Eric Paslay is a Grammy-nominated singer and songwriter. Diagnosed with type 1 when he was ten, he says diabetes has helped him in unexpected ways. Stacey talks to Eric about growing up type 1, knowing he wanted to be a musician as a teenager and what it's like now that those dreams are coming true. Eric is part of Dexcom’s Call of the Warrior campaign. Learn more about how you can use the hashtag #WarriorUp to raise money for diabetes charities through the month of November. Stacey mentions another Dexcom Warrior, Derek Theler, and plays a clip from his video. Previous episode with Derek here. In our Community Connection this week, meet The Betes Bros. Chris Pickering talks about this new advocacy and support group and shares about their experience helping out during Hurricane Harvey. Shoptalk this week is with the PADRE Foundation. Learn what this Southern California group is doing to support Pediatric Adolescent Diabetes Research Education. 2:30 Stacey talks about Diabetes Awareness Month efforts including those from JDRF, Project Blue November and a grass roots #MakeDiabetesVisible hashtag project. She shot to fame after an appearance on NBC’s The Voice, now RaeLynn is out with a big album, a big tour and lots of fans who have type 1 diabetes just like she does. Diagnosed at age 12, RaeLynn talks about managing diabetes on the road, challenges she faced early on and why she’s okay (sort of) with Blake Shelton being the food police. In our community connection, he was tired of waiting for options, so a North Carolina diabetes dad went on his own to get the Libre Flash Glucose Monitor not yet available in the US. Steve Espin explains why he wanted the device for his son and how he went on eBay to get it. Plus, in our Shoptalk segment, learn more about Dancing for Diabetes from Kelly Simbolick and about BetaBionics from John Costik. Get even more Diabetes Connections! 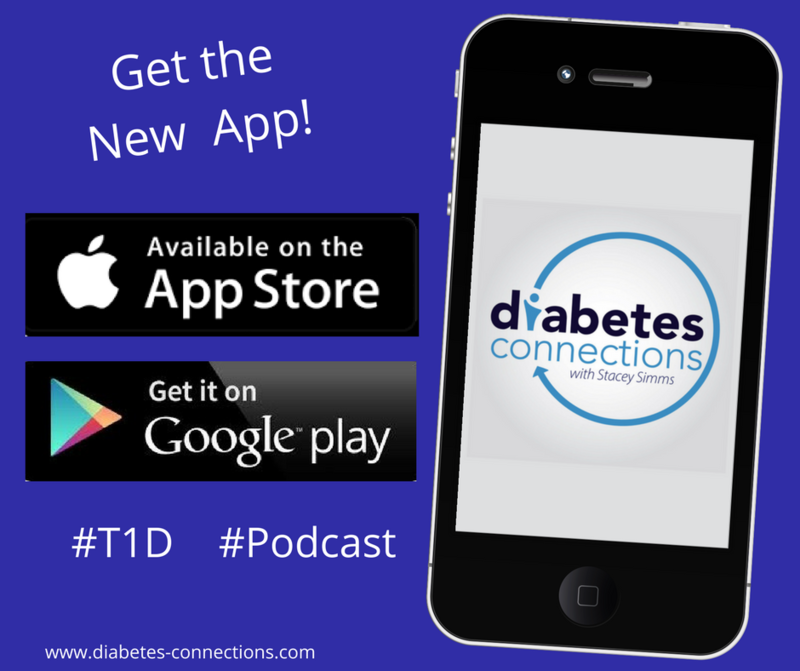 Get our App and listen to Diabetes Connections wherever you go! Actor Derek Theler will star in the upcoming show Marvel's New Warriors, a dream come true for him. We talk to Derek about growing up with type 1 and moving to LA to pursue his career, which included a 5-year run in the show, Baby Daddy. Derek shares how he and his sister who also has T1D grew up without diabetes role models and how that fueled his desire to be one now. He explains how his Baby Daddy audition was almost ruined by a persistent low blood sugar and shares a few funny commercials he starred in before his big break (including Kayak and State Farm). In our shoptalk segment.. meet Amy Burrows and Becky Marval from Connected in Motion and Emily Imblum from Pump Peelz.. Best-selling author and radio host Kurt Anderson is out with a blockbuster book, "Fantasyland, How America Went Haywire, a 500 year history." You may have seen him on the cover of The Atlantic Magazine and all over cable news this month. But you may not know he lives with type 1 diabetes. Stacey and Kurt talk about Fantasyland, as well as his other books like the fictional True Believers, where the main character has type 1. In Shoptalk this week, hear about a brand new product. It's called InPen and it aims to give people who use shots the same calculations & ease of use as people who use pumps. Stacey talks to Tony Galliani from Companion Medical about the product and the company.